The cover of “The Talking Book Reads Itself to the Blind.” Click to enlarge. So begins “The Talking Book Reads Itself to the Blind,” a pamphlet in our collection likely printed in the early-to-mid 1940s. 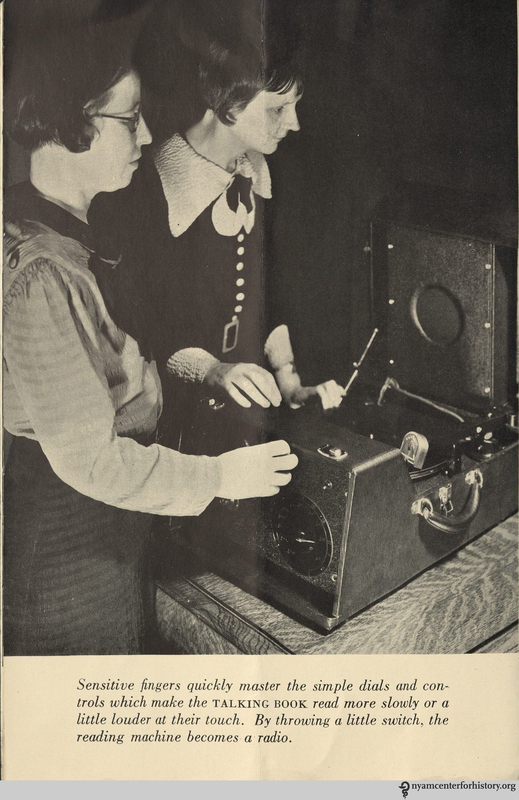 In the late 1920s, the American Foundation for the Blind (AFB) began researching ways to provide audio books, or Talking Books, for people with vision loss. 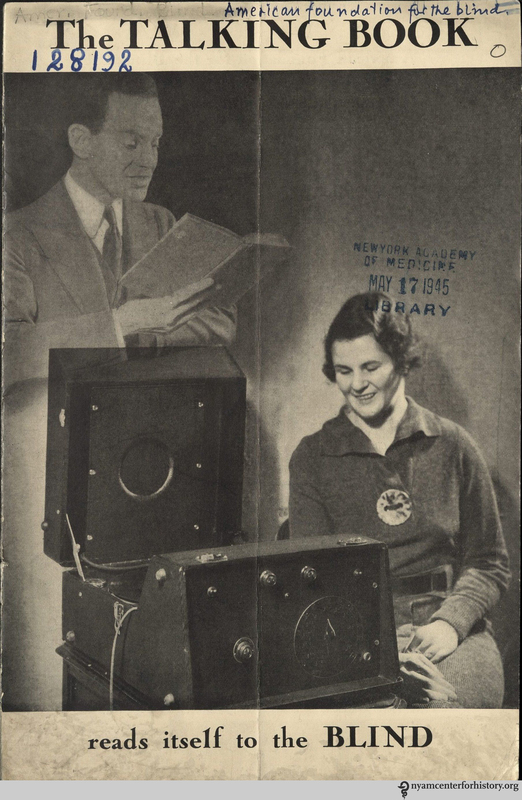 Through a partnership with RCA Victor and with government, Carnegie Corporation, and donor support, the Talking Book and Talking Book machine became viable in the 1930s. The list of available books is a fun look at what titles were popular in the 1930s and 1940s. Some items remain classics, while others have lost their luster over the years. Maybe it’s time to revive interest in Booth Tarkington’s Presenting Lily Mars or John Masefield’s The Bird of Dawning. 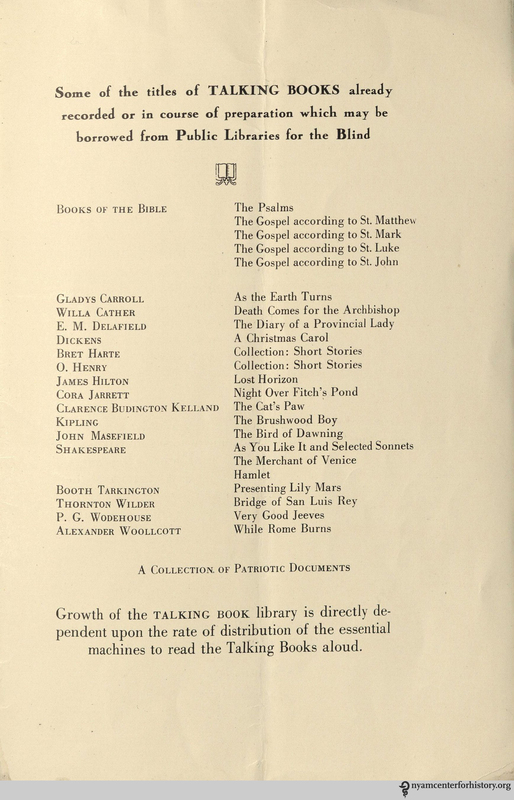 A list of available Talking Books advertised in “The Talking Book Reads Itself to the Blind.” Click to enlarge. For more on the history of Talking Books, visit the American Foundation for the Blind’s online exhibit. 1. The Talking book reads itself to the blind. New York: American Foundation for the Blind. 2. American Foundation for the Blind. AFB Talking Book Exhibit. 2009. Available at: http://www.afb.org/talkingbook/home.asp. Accessed April 18, 2014. This entry was posted in Collections, History of medicine and tagged American Foundation for the Blind, audio books, blindness, health pamphlet, National Library Service for the Blind and Physically Handicapped, Talking Book by nyamhistorymed. Bookmark the permalink.